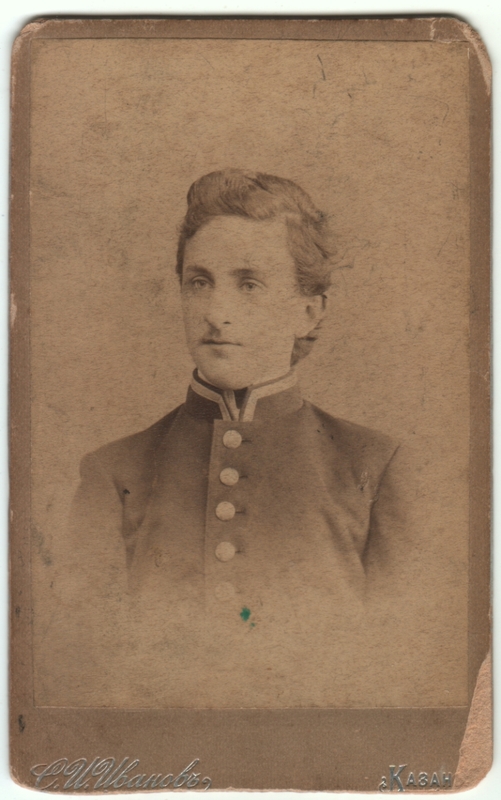 Carte de visite (or perhaps a CDV-sized cabinet card) measuring just under 2.5 x 4.25 inches. 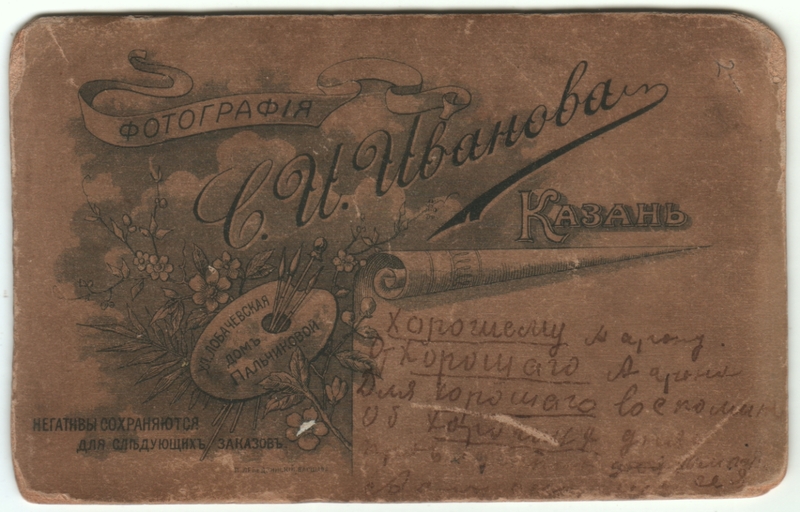 If my transliteration is correct, the photographer is S. I. Ivanova of Kazan, Russia. Click here to see the information on the back. A reader joked yesterday that my research was getting good enough that I wouldn’t need the input of my readers. Don’t worry, there will always be photos like this that send me on wild goose chases through the internet and still leave me stumped. Sorting through my photos, I would see this one and notice the delicate face atop the uniform, and, of course, the Russian on the back. I finally thought, “Just what IS that uniform?”, and decided to look into it. I took just enough Russian in college that, decades later, I can decipher the location Kazan. That turns out to be a city in Russia, over a thousand years old, currently the capital of the Republic of Tatarstan, and the eighth largest city in Russia. Unlike locations in republics that have broken away to become independent nations since the fall of the Soviet Union, Kazan has always been, and still is, Russian. Since the uniform looked vaguely military, I figured it simplified things that Kazan hadn’t shifted allegiances, and since I figured this was a pre-Revolution photo, I started searching for Imperial Russia military uniforms. But I couldn’t find a good match. Similar in some ways, but not the same. Finally I found this uniform, owned by the Tsar himself, and I thought, “There you go! Strip off the epaulets and it’s the same uniform! Wouldn’t it make sense that somebody less than the Tsar would wear a uniform that was less fancy?” It turns out to be the uniform the Tsar wore as Colonel-in-Chief of the 2nd Dragoons (Royal Scots Grey). “Wait, WHAT! ?” Yes, it turns out that, upon his marriage to the German-born Alexandra in 1894, Tsar Nicholas II was appointed to this position by Alexandra’s grandmother, Queen Victoria. Nevermind that the Scots regiment had fought the Russians just forty years earlier in the Battle of Balaklava. Confusing enough? (It’s been said that one of the great sad ironies of World War I was that its principle combatants, England’s King George V, Germany’s Kaiser Wilhelm II, and Russia’s Tsar Nicholas II, were all cousins.) Nicholas apparently took this appointment seriously, and he is still honored to some degree in the regiment. But while that meant there was a Scots-Russian connection, I wasn’t convinced that any Russian other than the Tsar would be wearing this uniform. So might this be a visiting Scot? Then why would he be so far afield in Kazan? Does the extra writing offer a clue? It could be anything from top-secret military plans to a shopping list. Frankly, for all I know, this could be a guy proudly getting his photo taken displaying the outfit he wears in his job as a hotel doorman. I’m really no closer to feeling like I have a grasp on this photo than when I started. But oh, well, it’s still interesting to look at. Have you tried translating the writing on the back? I had a similar situation with a German CDV with handwriting on the back, despite the wonders of google translate I couldn’t work it out. I found an ancestry message board that had others with similar issues, so I posted pictures of the writing and some lovely people managed to translate it! Maybe you could do something similar? Thanks, Sarah! The handwritten Cyrillic is a little too hard for me to read to try transliterating and then translating, but if it were essential for me to figure it all out, I’m sure there are other avenues I could pursue. It’s great to hear that you’ve had success with something similar! Yes, the back has a lot to look at and try to decipher. Thanks, Alessandro! Oh no! Now my comments require research, too! 🙂 That’s funny. It took a moment to realize you were spelling English words phonetically in Cyrillic. I don’t speak Russian, but I took a couple semesters in college and can slowly pick my way through the alphabet and recognize certain words. фотография, for instance, is photograph. But antique handwriting can be hard enough in English. Of course, somebody might recognize the uniform regardless. And thanks for making ME smile. 🙂 I’m so glad you are enjoying the blog. I’m glad I’m not the only one who gets stumped by these things, though the search for information can be fun. And thanks for the link. Your’s are great! Thanks very much! If the search weren’t rewarding in itself, we’d probably throw our hands up in disgust and find another hobby, haha! My theory would be that he gave this photo of himself to a friend at graduation. Oh, thank you! That’s very helpful. And I’m glad that even somebody with more fluency in the language was having trouble deciphering the writing. By the way, you may also be interested in another photo with a similar uniform, posted here. Isn’t it interesting that young men in such distant parts of the Empire would be dressed in the same uniform. Yes, it is. Of course, they might look different in person, different colors or something, but from what we can see here, they look very much alike. These are wonderful! Please thank you friend for all the information she’s provided.